In this episode, Robert and I explore Snapchat’s financials and suggest the priorities Snap should focus on to stay in the game. 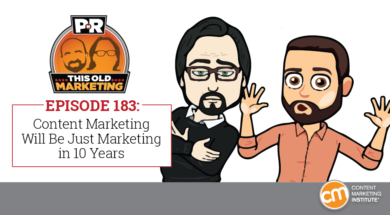 We also discuss content marketing’s future as an intrinsic marketing function that’s indistinguishable from the whole. Rants and raves include Wendy’s chicken nuggets and the Vivendi/Havas merger; then we close the show with an example of the week from United Feature Syndicate. Snapchat has a user growth problem on its hands (09:40): The Verge brings word that Snap’s first earnings report since its IPO shows growth rates and revenue that fell short of Wall Street expectations, contributing to a financial loss that’s twice the amount it lost last year. While I feel the numbers still add up to an encouraging rate of revenue per user, in my mind the real question here is, where will the company’s revenue be coming from in the future? Will content marketing lose its distinct identity? (21:03): A recent Gartner blog post predicts a future where helpful, engaging, and contextually relevant content will be the hallmark of all marketing – not just the specific discipline we currently know as content marketing. We were both thrilled to see an analyst firm really capture the essence of the argument we’ve been making for years – we just hope this vision comes to fruition before I hit my 74th birthday. The CMO role is starting to shift (27:36): In a related conversation, I point out an article on Marketing Dive, which explores the emergence of the “hybrid CMO” role and its potential to enable companies to speak with a single voice throughout the customer journey. The one thing I found lacking in this conversation is that, in my mind, the champion of the customer experience should be the CEO – not the CMO – no matter what other changes may come to the C-suite. Brightcove – The Science of Social Video: With eight in 10 consumers engaging with brands on social media, and three in four consumers linking social video viewing to purchasing decisions, we examine how brands can make the most of this opportunity. 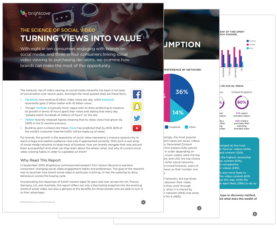 Download your copy of The Science of Social Video to learn how to turn social video views into value. Joe’s rave: In more Marketing Dive news, a 16-year-old’s quest for internet fame is paying off in golden nuggets – that is, Wendy’s chicken nuggets. The fast food company is rewarding Carter Wilkerson with a year’s supply of its chicken treats after a tweet he posted to the company broke Twitter’s re-tweet record. I applaud Carter for building a media platform, NuggsforCarter, from his experience, and feel that Wendy’s did the right thing by feeding Carter’s passion, even though he fell short of their original 18 million re-tweets benchmark. Joe’s commentary: An op-ed in TheMediaBriefing ponders the long-term sustainability of the revenue boosts that publications like The New York Times and the Guardian have been enjoying over the last year, and predicts that they will eventually need to pivot on their business models and, possibly, leave behind their coverage of niche verticals. Not only do I feel the author is right on the money with his assertions, I see this as a huge opportunity for brands to come in and fill the audience gaps left open when these pivots occur. Robert’s rave: Robert gives a shout-out to another great article he found on Marketing Dive, which talks about why consultancies aren’t upending the agency model just yet. He feels it does a great job of framing the issues from both sides of the equation in a really authentic way. Robert’s commentary: In media news from across the pond, The Drum asks if a potential conflict of interest might sink the proposed Vivendi-Havas merger. The thing Robert finds most interesting is that Vivendi explains its purchase interest as its way of evolving agency services into the larger media business it has built. 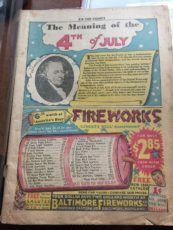 While sifting through some family documents, I came across what looked to be a comic book from June 1940. However, noticing that the book didn’t have a cover and was printed on newspaper, I did some research and discovered that it was actually a 64-page collection of comic strips, which was regularly distributed as an insertion in Sunday newspapers in several markets, including Chicago and New York. The particular issue I found was called Tip Top Comics, and was published by United Feature Syndicate, which purchased the rights to distribute the comics, and then monetized the content in multiple ways. For example, UFS would tease out a portion of the story from each of the popular comic strips in its collection (which included Tarzan, Li’l Abner, and others), but would require readers to subscribe to the comic or purchase the full issue if they wanted to see how the story ended. UFS also sold advertising and sponsored content against its supplemental publications. For example, in the issue I found, there was an entire section of articles on collecting stamps, which was surrounded by ads from companies that sold stamps. This technique of sponsoring a section of content within a custom content piece is still used today – we now call it native advertising. So I tip my hat to Tip Top Comics for creating a This Old Marketing example that was well ahead of its time.